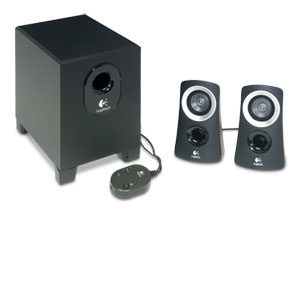 The Logitech Z313 Computer Speaker System provides rich, enveloping sounds for a complete music or gaming experience. Perfect for placement next to your desktop PC, the Logitech Z313 is equipped with two satellites, one subwoofer and a control pod that allows you to quickly power it on. The compact subwoofer easily fits into any narrow space, delivering deep bass and clear sounds for your music enjoyment. With the control pod, you can connect a pair of headphones to delve through your action-packed gaming or listen to your favorite songs in privacy. Compatible with both Windows and Mac, the Logitech Z313 Computer Speaker System brings entertainment fun to the forefront.